Baba Gurbaksh Singh jee was a very well known and respected Singh, who had the honour of being martyred while defending Sree Darbaar Sahib. Baba jee was of village Leel and had received amrit at Sree Amritsar Sahib, due to the inspiration of Bhai Manee Singh jee. Baba Gurbaksh Singh was always dressed in blue baaNaa and kept a very strong rehit. He would awake at amrit vela and do ishnaan and while reciting baaNee, would tie his dumalla. Baba jee loved Sarbloh, he would offer his respect to his sarbloh shastars i.e. kirpans, chakars, toRaas (metal cable tied around dastaar), kaRas, etc and then put them on. He would finally put on a mala of sarbloh around his neck and also many sarbloh kaRas and simarnaas. Baba jee's dastaar also had many toRaas tied into it. He would also wear a sarbloh armour. Other features Panth Parkash mentions about the way Baba jee looked was that he wore a very long 1.5 yard kacherra and always kept a long stick with him. Every amrit vela then, after dressing himself in his baaNaa, Baba jee sat in the divaan at Sree Akaal Takhat Sahib. It did not matter who came to meet him, whether a powerful Sardar or a lowly peasant, he greeted all people in the same way and with the same respect. He had absolutely no worldly aspirations or greed. Whenever there was a battle, Baba jee would always go and confront the enemy. He would take the Nishaan Sahib himself and advance. With the beat of the nagara, Baba jee used to be in the forefront to confront the enemy. The Khalsa had scattered when Ahmed Shah Abdali brought his army through the Punjab. Some Singhs went to the mountains where they were looted by the mountain-people; others went and hid around the rivers where they were not only looted but also attacked by lions and other animals. Those Singhs who decided to stay in Majha and not retreat were turned over to the Afghans by traitors and informers. In Malwa, the Singhs also fared no better and had to go from house to house like beggars. At Sree Amritsar, the Sarbat Khalsa gathered one day and after the night divaan, decided to abandon Sree Amritsar and leave together for Malwa. Baba Gurbaksh Singh then rose and addressed the Singhs and said, "Is there any Singh in the Panth today, who would fight with the Afghans and sacrifice his head and then go to Dargah and with his sacrifice have Karta-Purakh listen to his request and ensure the Chardi Kala of the Panth? One who could do ardaas to Karta-Purakh and bring an end to these dark days? Is there any Singh who is so determined and is such a devotee of naam and one who is so strong in rehit? Is there anyone who will give his life for the rest of the Khalsa and with his sacrifice be able to wipe out the enemy?" [It is said that when the enemy kills a bhagat of Vahiguru, the bad karma of committing such an act results in the enemy also being wiped out. Baba jee was asking if there was such a bhagat in the Panth who could give such a sacrifice]. The Singhs listened to Baba Gurbaksh Singh and replied, "Baba jee, is there any Singh better for this than you? There is no one with more kamaiee. No one else has the power to abandon their body and go to Dargah like you do. No one else's request will be more acceptable to Vahiguru than yours." Baba jee listened to these words and then bowed his head and agreed to the request. Baba jee then called out, "I want to be Shaheed! If there is any other Gurmukh who wishes to come with me to Dargah, then let them also come. When there is a marriage, the groom goes with his Sarbaalha (best man) and with a large baraat (marriage party). I am going to marry the bride of Death. Are there Singhs who would be my Sarbaalhas?" Hearing Baba jee's call, many Singhs rose and stood with Baba jee. They said, "We were waiting for your call. With your permission we will be your Sarbaalhas." Seeing these Singhs stand, many more Singhs also rose and said "then we all will come with you in the baraat!" Baba jee then adressed all the Singhs and said, "Khalsa jee! You have all agreed to join my wedding party. We will give our heads in this Dharam Yudh and in this way we will be married. We will get Shaheedee and Guru Sahib will give us all Kingships. No, even bigger rewards than kingships. That Singh who gives his head in battle will be the King of Kings. " The Singhs Prepare for The "Wedding"
By this time, Ahmed Shah Abdali had arrived in Lahore. He was preparing to go to Delhi when he heard about the gathering of the Khalsa at Sree Amritsar. He decided that on the way to Delhi, he would stop at Sree Amritsar and slaughter all the Sikhs. Hearing of the advance of Abdali, some of the cowards who had remained at Sree Amritsar with Baba jee ran away. Baba jee also encouraged them to leave and said "Go! Leave now, otherwise we won't let you leave later!" Only a few Singhs remained now. The remaining Singhs were all chardee kala naam abhyaasee Gursikhs. They prepared for their death like a groom prepares for his wedding. They all had new cholas sewn. Some decided to sew blue, and others wore white and others kesree. They gathered in front of Sree Akaal Takhat Sahib and eagerly awaited the enemy. They would stand on their toes to see if the enemy was yet visible on the horizon. They were discussing how they would give their Shaheedees and then in Dargah would stop the Afghan attacks forever. The day the Afghans were expected to attack, the Singhs all rose at amrit vela. They began to prepare like it was their wedding day. They sprinkled themselves with attar and rose scents, and rubbed sandal paste on their bodies. 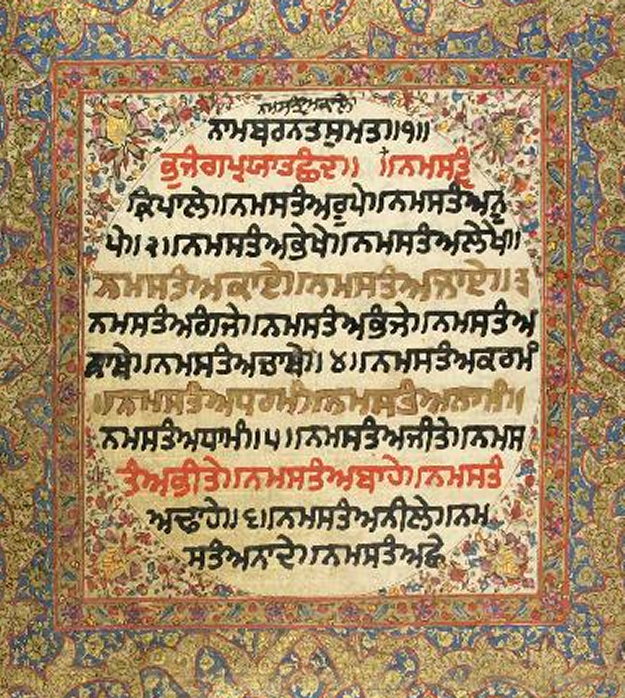 As they did this, they sang "GhoReeaa(n)" shabads from Sree Guru Granth Sahib. They then bathed in Sree Amritsar Sahib and then gathered at Sree Akaal Takhat. The Singhs distributed Degh and then as a group left for darshan of Sree Darbaar Sahib. The group of Singhs was led by a Nishaan Sahib and nagaaras were beating. Baba jee asked the Singhs to sing shabads of happiness as this was their wedding day and the wedding party was now moving. Baba jee and the other Singhs also gave away all the money they had to the needy. They arrived at Sree Darbaar Sahib and did parkarma. Once inside, they showered Sree Guru Granth Sahib with flowers and then did Ardaas. Baba jee standing before Satguru Granth Sahib spoke the following words, "True Emperor, protector of the poor! Your Khalsa is going now to marry the bride of Death. We are going to battle the Dushts. Satguru jee! May our Sikhee and our kesh stay intact through our final breaths." The Afghans in the meantime had began to move towards Sree Amritsar. They had prepared for a massive battle and brought a large army. They were wearing armour and metal helmets. They had decided to do battle in such a way that the Singhs would be killed but they themselves would incur minimal casualties. They had brought long weapons which could kill from a distance such as large guns. Baba jee, after offering ardaas at Sree Darbaar Sahib, returned with the Singhs to Sree Akaal Takhat Sahib to listen to keertan and await the enemy. The keertanees began to recite keertan and the Singhs would ask that certain shabads they wanted to hear be sung. The GhoReeaa(n) shabads were again recited. In this way, the entire night passed in listening to keertan. At day break, the enemy had arrived. The Singhs upon seeing the Afghan army came down from Sree Akaal Takhat Sahib. They bowed to their shastars (kirpaans, kataars and talwaars) and then grabbed them. Some Singhs grabbed very big sticks and others mounted horses. The Singhs vied to go ahead of each other and kept moving forward. The Singhs argued about who had the right to attain Shaheedee first. The Nishaan Sahibs were furling and the beat of nagaaraas was echoing. The Singhs were like grooms anxious to marry a beautiful wife and seeing the time come closer, becoming more and more excited. If we step forward, our honour remains intact, if we step back, they will say we are retreating! Do not look for assistance anymore, just go forward! Now go forward and give your heads!" . Hearing Baba jee's cry, the Singhs all charged forward, not one Singh took a step back. They fell upon the Afghans like a lion on deer. The Singhs were all eager to become Shaheed as quickly as possible. They had no hope for life. Baba jee again called out, "Khalsa jee! Become Shaheed and cross this world-ocean! Let us go to the court of Satguru jee and ask that the Afghans never attack here again and that the Khalsa should rule! What is the delay now? Fall upon the enemy!" Wherever the Singhs stood their ground against the Afghans, they eventually fell. Afghan reinforcements also arrived. The Singhs never looked back, some Afghans even began to run away. Seeing this, Baba jee bellowed, "Don't let them go Khalsa jee! Stand and fight this Dharam Yudh!" The Afghans did not understand what Baba jee was saying and were surprised to the see the Singhs run after them. They then trained their guns upon the Singhs. Many Singhs standing with Baba jee fell to the rain of bullets. Baba jee then took out his heavy Tegha and ran towards the enemy. He swung his Tegha with such force that it cut through the armour of the Afghans. Baba jee would aim for the face and neck where there was less armour. The Afghans all then began to cover their faces with their shields. The Singhs seeing the cowardice of the Afghans threw aside their own shields and challenged, "look! We've thrown aside our shields, do you have the bravery to do the same? We'll take your blows without any shield, will you take ours?" The Singhs continued to run forward and did not show any fear of death. They did not so much as look backwards. The Afghans continued to fall back and began to wonder why such a small group was not finishing and whether these few Singhs would cause their defeat. They could not bear the brunt of the Singhs' sword blows. They fell back and began to fire bullets and arrows. Baba jee was soaked in blood like he had just been playing Holi with colours. Eventually because of loss of blood, Baba jee became very weak. He could not walk anymore and became very tired. But with every ounce of strength in his being, he put one foot ahead of the other. He was careful that no one would say he retreated. Baba jee called to the remaining Singhs, "Singhs! Do not shame the BaaNaa we wear! May our Shaheedees be perfect and may we fall in the battlefield!" By this time, even more Afghan reinforcements arrived. The new Afghans surrounded the wounded Baba jee and pierced him with their long spears. Baba jee with great effort used his khanda to cut off the spears and the Afghans again fell back. Baba jee would not look back but the enemy had surrounded him and knocked him to the ground from behind with a blow from a spear. Baba jee fell to his knees. Baba jee thought in his mind, "I cannot let go of my khanda. If I let it go, the enemy may consider me helpless and not attack. I will not be able to become Shaheed and my wish will not be fulfilled. If I do not take care of this moment, who knows if I ever get the opportunity for Shaheedee again?" Baba jee then again raised his khanda and called to the Afghans, "Come! Try to take my head!" He put his head forward like an offering. Again the enemy surrounded him and fighting on his knees, Baba jee was beheaded by the enemy and in this way attained Shaheedee. Baba jee's vow was completed , he offered his Sis in the same fashion as Sree Guru Tegh Bahadur Jee. The enemy rejoiced at the Shaheedee of Baba Gurbaksh Singh jee and shouted out slogans in relief. The Khalsa too rejoiced at the Shaheedee of Baba jee in its own way. Shaheed Khalsa was waiting in anticipation of Baba Gurbaksh Singh Jee. Baba Gurbaksh Singh jee was received in Grandeur and carried on royal carriage with Shaheed Khalsa wearing Blue and holding Nishan Sahibs and Nagarey. Night fell and the Afghans were in shock after seeing such a bloody battle. They set up camp near the Bhangi fort and fell into a deep sleep. The Singhs in the area though rose at night and attacked the camp. The Singhs stole horses and slaughtered the Afghans. The remaining Afghans could not sleep and at daybreak, quickly ran from the area. The Khalsa decided to erect a Shaheed Ganj in memory of Baba Gurbaksh Singh and the rest of the Singhs. This place was seen by many to have a very strong presence of Kala and nothing would seem to come near it. Baba jee's Shaheedee was glorious and indeed, the Afghan power did begin to fall after this point. The Panth believed that Baba Jee’s benti was heard at the feet of Guru Jee, within a few years, the Sikhs began to rule Punjab and the Sikh Kingdoms were established.